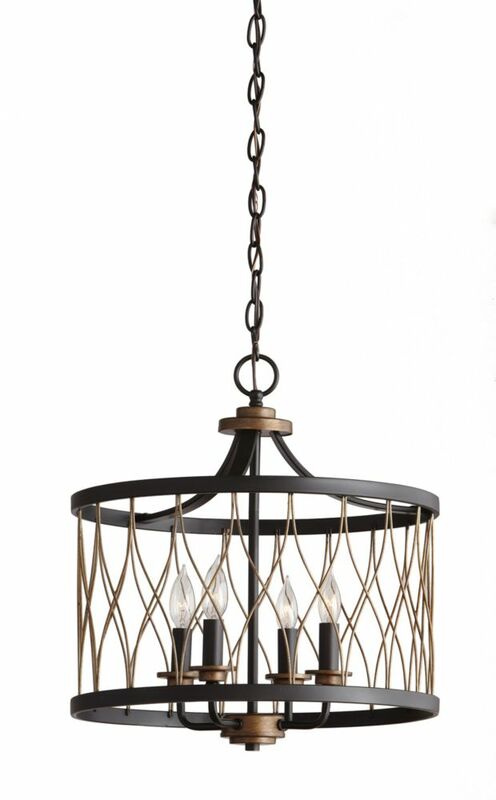 This pendant features a wire mesh drum shade shown with candelabra bulbs (not included). Contemporary appeal for chic to modern decor. Perfect over dining areas. 4-Light 60W Black and Gold Pendant with Geometric Wire Metal Shade This pendant features a wire mesh drum shade shown with candelabra bulbs (not included). Contemporary appeal for chic to modern decor. Perfect over dining areas. HDC 4 Light ORB/Gold Pendant is rated 5.0 out of 5 by 1. Rated 5 out of 5 by Russere from Worked perfectly!! I purchased 3 of these lights for a hall that measures 33' long by 7' wide. The space required a substantial fixture that could illuminate the expansive area. These fixtures fit into the space perfectly. I would highly recommend them.